Lions believe that the the desire to serve one’s community and be successful require skills and strength of character. We believe that these skills must be developed as early as possible for individuals to receive the greatest benefit throughout their lives. Since the Lions Club International Foundation (LCIF) took ownership of this program they have awarded more than 360 grants for a cumulative total of more than $20 million to expand or establish Lions Quest programs across the United States and around the world. Since that time, the program has grown to include 40 languages in over 90 countries across the globe. There are programs specially designed for the needs of elementary, middle, and high school students. The middle school years are the most rapid period of growth and development since infancy. 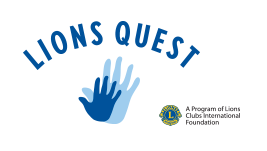 Lions Quest Skills for Adolescence is designed to help middle school students, parents, and teachers cope with the physical, emotional, and social challenges of early adolescence. The Lions Quest program is fully with both independent reviews, and internal evaluations. Please visit the Lions Quest website to learn more about how your school can adopt this incredible character education program.